Corner of Morrow and Jadwin, Gamboa. Educational activities refreshments and games hosted by the El Valle Amphibian Conservation Center and the Golden Frog Mascott. 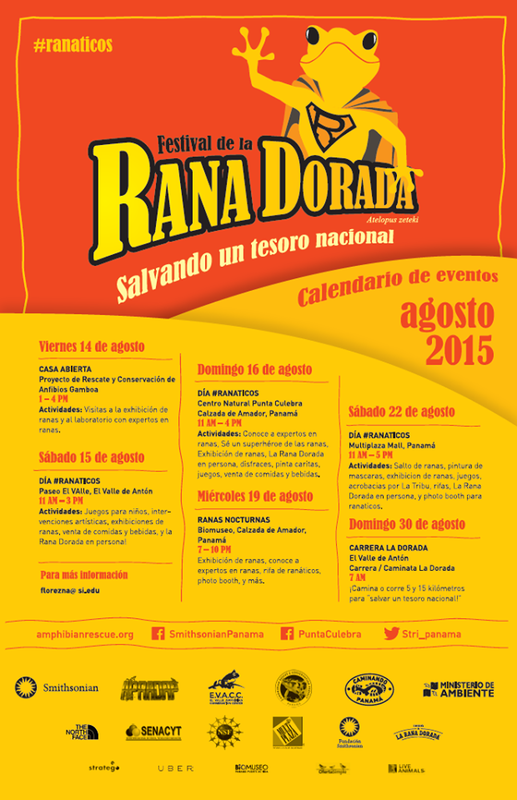 Meet the golden frog mascott, tour an exhibition of Panama’s most beautiful frogs, games activities and refreshments. Frog raffle, photo booth, exhibition and talk with frog experts. Face painting, frog jumping, photobooth and acrobatics by La Tribu. Register for a race for golden frogs hosted by Caminando Panama. Presented by: Autoridad Nacional del Ambiente, Smithsonian Tropical Research Institute, Fundacion Smithsonian, El Valle Amphibian Conservation Center, Panama Amphibian Rescue and Conservation Project, La Rana Dorada Pub, SENACYT, USAID, National Science Foundation, APRADAP, Uber, Biomuseo, Oferta simple, Live animals, Stratego , Multiplaza Pacifico, North Face, Caminando Panama.